His father worked on a farm and Smullen became involved in horses at the age of 11 when accompanying his brother Sean to visit Joanna Morgan’s yard. Went on to show jumping and eventing. Served four-year apprenticeship with local trainer Tommy Lacy, enjoying first success aboard Vicosa in an apprentices’ handicap at Dundalk on June 11, 1993. 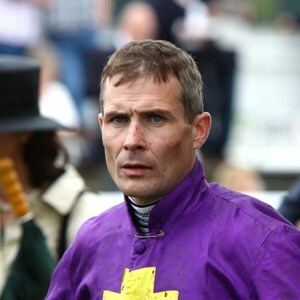 It was Lacy’s suggestion that he rode for trainer Erwan Charpy in Dubai in the winter of 1997 and he went on to become one of leading riders in the Middle-East. He spent two years with trainer Tommy Stack, who gave him first Group win when Tarascon won 1997 Moyglare Stud Stakes. Became stable jockey to Dermot Weld in 1999 following Mick Kinane’s departure to Aidan O’Brien’s stable. Smullen is married to former trainer (and Aidan O’Brien’s sister-in-law) Frances Crowley. He has won two British Classics, the 2016 Investec Derby aboard Harzand, and the 2003 running of the 2000 Guineas, with Refuse To Bend. He also landed the Gold Cup at Royal Ascot in 2010 on Rite Of Passage. Among his numerous Group 1 successes in Ireland are the Irish Derby (2004 Grey Swallow), the Irish 1000 Guineas (2006 Nightime, 2010 Bethrah) and the Irish St Leger (Vinnie Roe 2001, 2002, 2003 and 2004). He also won the Breeders’ Cup Marathon on Muhanak in 2008. He enjoyed a marvellous QIPCO British Champions Day in 2012, winning the QIPCO British Champions Long Distance Cup (Rite Of Passage) and the QIPCO British Champions Fillies And Mares Stakes (Sapphire). His highlight in 2015 was when steering the well-backed Fascinating Rock to victory in the QIPCO Champion Stakes on Champions Day.